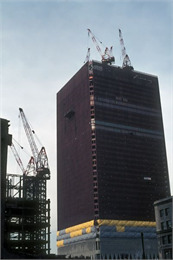 Progress of Construction, 1969 ca. 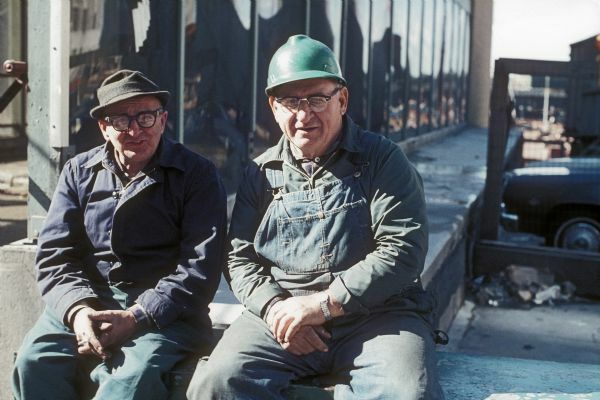 In 1960's New York City, Richard Quinney took hundreds of black-and-white and color photographs in Manhattan, documenting life on the island. This collection of over 150 color photographs shows the construction of the World Trade Center in 1969, and the transformation of the city. 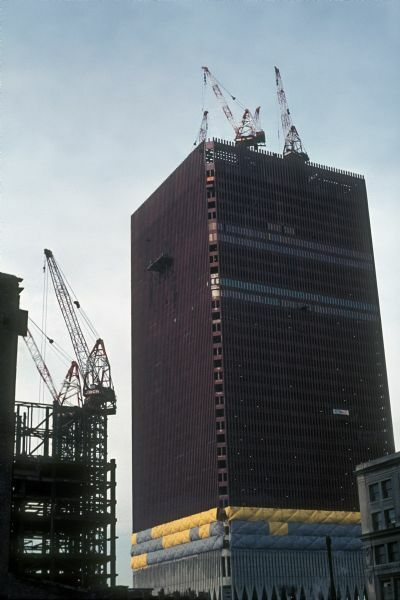 These color images of the World Trade Center under construction in 1969 bring a new perspective to our impressions of that structure. Native Wisconsinite Richard Quinney was on the faculty at NYU at the time; he spent the spring roaming the city, capturing the images that caught his eye. Quinney was especially fascinated with the construction of the World Trade Center, not just visually, but also in the context of the city's changing landscape and the political and social climate of the time. The 161 color slides he produced of the rising structure gained a dramatic new significance on September 11, 2001, when the Twin Towers fell victim to terrorist attack. As Quinney relates in his book "Of Time and Place: A Farm in Wisconsin," his ancestors emigrated from Ireland and England and settled in southeastern Wisconsin. He was born on May 6th, 1934 and grew up on his family’s farm in Walworth County. He earned his bachelor’s degree from Carroll College, a master’s in sociology from Northwestern University and his PhD in sociology at the University of Wisconsin. In 1958 he married Valerie Yow and they had a daughter, Laura, the next year. A second daughter, Ann, was born in 1970. He taught at a number of universities, most extensively at Northern Illinois University from 1983-1998. In 1991, he married Solveig Holmes. Widely published and considered a pioneer in his field, Quinney developed a Marxist and conflict theory approach to criminology that highlights the role of power imbalances in the process of the criminalization of deviance. His later work focused on non-violence and Buddhist approaches to conflict resolution. After retirement, Quinney and his brother Ralph began a project to revitalize his family’s farm using sustainable agriculture and he founded the small press, Borderland books, which publishes his and others’ books in traditional art and craft style printing. Note: More information about Quinney and his work can be found at the website of his small press, Borderland Books. Many of Quinney's scholarly and autobiographical books can be accessed through the Wisconsin Historical Society’s library and the University of Wisconsin’s library. See information on Visiting the Library and Archives. 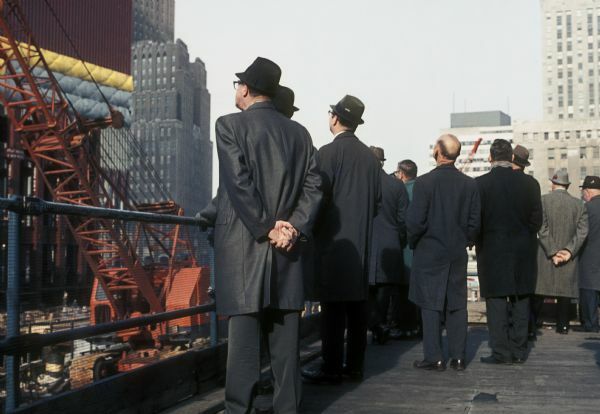 Quinney's 2011 book "Once Upon an Island" contains 175 photographs of Manhattan, including color photographs of the construction of the World Trade Center and black-and-white images that capture the experience of living on the island at the end of the 1960s. For his comments on his experience documenting the construction and the significance these photographs possess today, see "110 Stories" in the Wisconsin Magazine of History, Autumn 2002 (Vol. 86, No. 1).